In 1980 there was not yet a clear winning architecture for microprocessors. Many of the companies of the 1970’s were still churning out designs, hoping for design wins. Intel had yet to become a dominating force, though their 8086 line was becoming popular. AMD was one of the innovators of the time. Now known for their x86 processor, AMD made many other designs that were very successful. In 1980 AMD was already making 2 16-bit class processors. They were a second source for the Intel 8086 (8/16 bit) as well as the primary second source for the Zilog Z8000 processor. They soon would pick up manufacturing demand for the Intel MCS-51 line as well. This was not enough for AMD, they sought to design a 16-bit microprocessor that would excel at high speed control applications (such as telecom and disk controllers). Thus began one of the most ambitious and complex designs of the time. In order to meet their performance goals the design had to be done in ECL, on a bipolar process, this is a bit more complicated for a large device then a NMOS part, mainly due to its power requirements and heat. Documentation suggests that all versions of the 29116 were licensed to Thomson/CSF for the European market but I have not yet found an example of one. 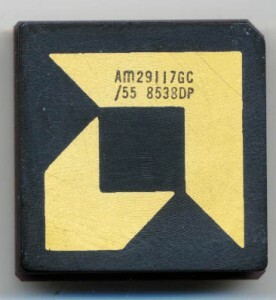 Texas Instruments made a copy of the CMOS 29116 called the SN74ACT29116 and 74ACT29116-1 both made on a 1u EPIC CMOS process. 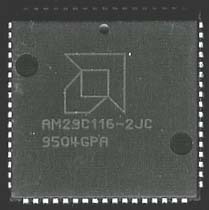 In addition Cypress semiconductor also made many CMOS versions known as the CY7C9116 and CY7C9117 with speeds up to 28MHz. These are usually marked with a max prop delay (such as CY7C9116-35 meaning a 35ns part, lower is faster in this case). Both Cypress and AMD continued to make the ‘116 into the late 1990’s. It continued to be used in control systems, video system, telecom products and many military applications. Its high speed and support for bit oriented instructions, as well as the ability to custom design a sequencer for it allowed it to be used in a wide range of products.